Digital Spy EastEnders' shippers were all a-flutter when someone started a thread posting that Shane Richie had confirmed on Twitter that no less than Dame Judi Dench was joining EastEnders for 8 episodes as Alfie's aunt. People, you have been pwnd. 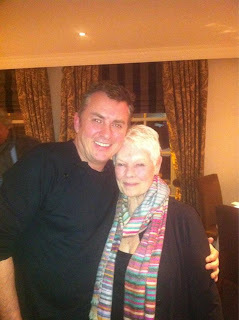 in my restaurant with mate @realshanerichie and Dame Judy Dench ! Trying to convince Judy to be Alfie moons Auntie. What do you reckon ? As you can see, there is no truth in what Richie said. If he thought it was a joke, he certainly doesn't take into consideration the gullibility of a certain demographic of his fandom, nor does he have any respect for either his employers or the character he plays. If he did, he would know that Alfie's "aunt" couldn't remotely be a Moon. Alfie's father was an only child. Putting cack about like this into the public domain does neither yourself nor your employer any favours, and it only emphasizes the increasing gullibility of the viewing public. With that in mind, take a hefty grain of salt with every mention Jo Joyner makes of her impending "break."